Our friends at House of Writers / Casa de Escritores invite you to participate in a literary and cultural event that will take place this Friday, Dec 5, from 6-9 p.m. at the Taqueria del Rio on 10230 16th Ave SW, White Center, WA. There you'll enjoy a variety of readings, music and food. Announcing another addition to the Conexión Marketing team! A warm welcome to Mauricio Ayón, Development Director for Conexión Marketing. Mauricio's a well-connected guy who has joined our team to help us strategize our approach. You may know him from the King County Hispanic Chamber of Commerce or other local organizations--Mauricio knows how to bring people together in great ways. Of course there are a lot of businesses that we can provide value to with our Hispanic marketing, communications and research services, but with Mauricio's assistance we're focusing on specific industries that have yet to get into the business of truly serving Latinos--and in which these companies will see a tremendous ROI. ¡Bienvenido, Mauricio! Why don't you welcome Mauricio personally? Feel free to do so at mauricio@conexion-marketing.com. p.s. I took this picture of him today at the delicious Salvadorean Bakery! mm mm good! 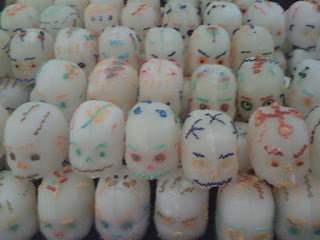 Happy Thanksgiving to all - I wanted to introduce you to a relatively new site called Mi Apogeo http://miapogeo.com/. No, it's not a Seattle-specific site, but it's a very cool interactive Latino community I thought you should know about. And it's in English, likely based on the fact that Latino youth in the U.S. are typically English-dominant and also that the majority of Hispanics online are somewhat bilingual and accustomed to English-language sites. 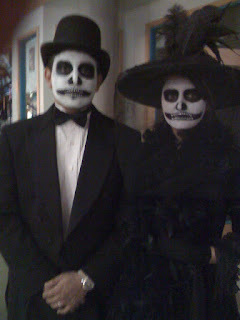 I was particularly interested to see submissions on Latinos and their Thanksgiving celebrations http://miapogeo.com/main/content/view/480/1051/. It's fun to see how people with different cultural backgrounds are managing to meld those into a very American celebration. Check it out! And be it Turkey Day--or Ham 'n' Clove Day, or Tamale Day--enjoy your Thanksgiving holiday, safely and happily! His name is Raul Villalobos, Jr., and he started recently as our marketing intern at Conexión Marketing. He's completing his bachelor's degree at the UW, and he's on the home stretch! He helps us with all kinds of stuff--today he's doing preliminary research on L.A. Hispanics and what percentage of that group travel by air and how they get to the airport. Raul's family is from Peru, and both his parents are good cooks. He shared a description of a traditional dish with us that is definitely a detour from American cuisine. I'll call it Shish-ka-hearts. The actual term for it is anticuchos. It's basically delicate fillets of heart, skewered. Raul says he doesn't like eating most organs that are typically eaten in Peru and other Latin American countries (is tongue an organ? he doesn't like that, either), but he does like him some anticuchos! After the Peruvian cuisine conversation, Gigi took it upon herself to visit the Latin tienda at Pike Place Market to pick up some Inca Cola, originally from Peru. Of course, in Peru they use cane sugar to sweeten it; in the New Jersey production we learned high fructose corn syrup is substituted. Smells like bubble gum, looks like Mountain Dew, tastes like heaven in a cup. We're working with Seattle Pro Música to help this choral ensemble promote its upcoming events, which are right up our alley! Enjoy the lively rhythms of Latin America and Spain as Seattle Pro Musica presents NAVIDAD: Christmas in the New World. The concert features a majestic candlelight processional and captivating Baroque villancicos for voices, guitars, and percussion, blending indigenous music from Spain, Africa, and Latin America. The unique percussion for this vivacious music, ranging from log drums and rain sticks to river stones and deer antlers, is sure to be a highlight of our annual holiday concert. Seattle Pro Musica performs this joyful music from the Baroque era by composers from Mexico, Guatemala, Peru and Bolivia. Also featured on these concerts are new works by contemporary Latin American composers from Venezuela, Brazil, Ecuador and Aruba. Some of these new works incorporate fascinating vocal techniques, with singers imitating the sounds of the Amazonian jungle, Latin American folk instruments and vocal percussion. In addition to singing in Spanish, Seattle Pro Musica will also perform works in Quechua (the language of the Incas, still spoken in Ecuador today), Nahautal (the language of the Aztecs) and Papamiento (the language spoken in Aruba and Bonaire), and Hausa (one of the main languages of the African Sahel. Performances also include a free pre-concert talk by conductor Karen P. Thomas one hour prior to all performances except Family Matinee. Learn more about the intriguing history of Latin American music, as well as the latest developments in choral music in Central and South America. Family Matinee at 3 pm. Music and fun at this shorter performance for children and families, which includes stories and a sing-along of favorite carols. Children twelve and under free with advance purchase. Please join us for a very special cultural celebration this holiday season! It's that time of year again! The Giving Tree – sponsored by the Seattle U Center for Service and Community Engagement – is a great way to help grant the holiday wish of a child or an elder in our community. They make it easy for us to step up and help. Starting Tuesday, November 25th, please stop by the Seattle University Student Center Pavilion, Room 124, to take a tag from our tree and buy a gift for a child at Childhaven or Treehouse and/or an elder at Elderhealth Northwest. Please return UNWRAPPED gifts with the tag attached by December 11th for delivery. If you have any questions, please contact David Henry, SJ at 206-296-2326 or henrytd@seattleu.edu. Thank you for helping them reach their goal of 100 gifts for the holidays! IT'S OFFICIAL - Ke Buena goes local! THIS JUST IN: Jaime Méndez and Mario Rodriguez (aka Zuper Mario), both longtime on-air talent over at the former Radio Sol, have been snatched up by Bustos Media's Ke Buena station on 1210 AM. This marks the first local venture of Bustos Media in our market that I'm aware of, and I am glad to see they're stepping up to the challenge! For so long, these stations have delivered music--and audiences--but their true presence in our market was lacking. This will give their AM station a big boost. So Jaime's beloved La Voz de Washington community program will resume on Ke Buena, M-F 3-4pm. Zuper Mario will bring back his show including music, entertainment and community interaction (including a unique brand of radio classifieds) from 4-8 each evening. ON THAT NOTE: Rebecca Lambert of Bustos Media is looking to hire! They're looking for one or two new account executives to support what should be some serious interest from advertisers. Contact her if you'd like more info on this opportunity at rlambert@bustosmedia.com. Since we're busy with focus groups these days, it occurred to me that it might be helpful to share some tips for successful Hispanic focus groups. Please note that these tips are based on seeking more recent immigrants versus American-born or acculturated Latinos. There are definitely some differences in how you manage this group. For example, when you're recruiting for the group, the screener should identify the qualified participant as Spanish-dominant. Many Latinos are bilingual, but immigrant Latinos will likely say they're more comfortable conversing in their native Spanish. These are likely your target (versus the more acculturated Latino who may be better integrated with the general market group or at the least involved in separate research). We recommend that Hispanic focus groups are kept small--6-8 participants is usually ideal. Why? The Latino participants are generally more likely than the general market participants to "follow the leader" and allow one participant to dominate and influence the rest of the group. By keeping the group small, there's more opportunity for each to speak his/her mind. Once your participants pass the screener and confirm attendance, you'll be wise to mention that they should make arrangements for their kids (as appropriate). So many times, I've moderated groups in which the participants show up with kids in tow. It's a shame, because they're perfectly qualified for the research, and yet now they're turned away because there are no accommodations for their kids. Better just say it up front. This goes for guests, too. Oftentimes their spouse or friend who may have driven shows up and expects to stay. This is not recommended, and it's wise to make it clear as you confirm their appointment. Sometimes it's been helpful to offer an additional cash bonus to the first to arrive, or to those who arrive before the actual start time, when possible. It's a definite incentive and compensates for any cultural differences in terms of how time is viewed! Keep writing exercises to a minimum if possible. We just learned this one recently. Writing assignments can be difficult for people who are not accustomed to writing and impossible for those who may not have learned to read. The immigrant population can include both groups, so it's best to keep the conversation going. We found in our last experience that it works to provide participants with sheets to rank their favorites (to avoid the influence of others), but to limit it to check marks and numbers versus explanations, for efficiency's sake. >>Please note that in no way am I making the assumption that foreign-born Latinos can't read/write! But when you're planning your research, it's helpful to understand that education isn't always accessible for those from other countries; they may have had to work at an early age, or help their parents, etc. Just a different culture than what most of us in the U.S. are familiar with. Let me know if you have other suggestions for our readers (or for us!). We're always learning! This morning I drove to work (unusual since it's just a walk down the street, but I had meetings in Redmond just a little later on). After paying the meter at 4th and Union, I bumped into the lovely Sandra Maqueda who just started at El Rey 1360 AM as the station's new community outreach director. She's also on-air 10-11 weekday mornings. She was interviewing Latinos for breast care awareness and asked to interview me (in Spanish). I told her I wasn't a Latina, but she seemed OK with that. ;-) She did a brief interview and then moved on. Said she was really enjoying being downtown and that there are so many Hispanics for her to talk to down here. I wish a few of our clients saw it that way! See, that's the unique thing about our market: Latinos are literally in every city--for example, did you know Issaquah, Mukilteo, and practically all of Seattle are seeing big growth in Hispanic populations? We're off to moderate a Spanish-language focus group about the new nutritional information available soon at fast-food restaurants. This focus group is not taking place in Yakima, or the TriCities--but right here in Seattle. Jaime Méndez back on the radiowaves! It's finally official--starting December 1st, Jaime Méndez will be making his debut on Ke Buena, where he's resuming his La Voz de Washington call-in show 3-4pm weekdays. Jaime was a DJ with a longtime Radio Sol program until the recent makeover into El Rey, when several of the regulars were taken off the air. He continues as a newscaster on the local Univision affiliate KUNS Northwest news. We're glad the local and very interactive show will have a place on the radiowaves once again. Following Jaime's show will be Zuper Mario, another unfortunate El Rey casualty. Glad to see you guys back in action! Let me know if you have any questions about how to get on the air with Jaime or Zuper Mario. Hola - we've been uber-busy around here the last few days, hence my lack of posts. We love our clients, but why is it that their requests seem to converge?! Hope your work is keeping you busy and challenged, too! Speaking of fuel--we've got multiple travel dates coming up next week and into December: Hispanic focus group work in Yakima, Tri-Cities, possibly Spokane and--what do you know--even Seattle (travel there only involves the Metro). But today I'm thinking about my trip to Sacramento, which will commence in just hours and last through Monday. Visiting my little sis and her family (younger son is turning 5!) and looking forward to that time with them. I've turned the boys on to V-Me, the Spanish-language public programming that is a great resource for parents who don't want their kids watching (sometimes unexpected trash), and they're hooked. Great programming for kids and adults, available in our market as well. That's all I've got today. Enjoy the weekend! Toallas higiénicas, compresas--call them what you will. I'm talking about Maxi Pads. Why? NEWSFLASH: I just learned that in Latin America it may be customary for women to choose pads over tampons! Why is this in my blog? Because we're talking about the Hispanic market, and what Latinos like and don't, and what traditions they or their families may bring from their homelands. Of course, this is all anecdotal, but it shows how makers of all things should do their research to understand the choices their target demographic is making, and why. The anecdotal reasons given for the pad-over-tampon choice is that girls may be discouraged from using tampons because of more conservative and/or Catholic practices of Latin American society. Once these girls get started with pads, they may be hooked 'til menopause. Another reason given is that tampons are a more expensive purchase in Latin America (and perhaps in the U.S. as well). Depending where are you from, tampons might not even be marketed, or our mothers didn't know about them (it all depends on levels of education and buying power). All four girls tried tampons but stopped using them because (1) it was uncomfortable and (2) they had read articles about all the chemicals companies use in manufacturing them. You may wish to learn that here in the U.S., it takes a while to find the “right” pad. In Latin America there are no “long,” “regular,” etc.--one size fits everybody! Also, here it’s not that easy to find details about the type of pad (what are they made of, is the cover cotton or plastic?). Interesante. A recent study published by Business Wire shows that the leading company in the 8-country Latin America market that was studied in 2006 was Procter & Gamble; the second-largest player was Kimberly-Clark; Johnson & Johnson took third place. What this means to U.S. marketers is that these manufacturer's brands may already have clout among new Latina immigrants--so there's less of a barrier to acquire those consumers stateside. And, on the flip-side, it translates to additional challenges for the other brands looking to appeal to this segment. Look for more feminine protection updates, coming your way. Or not. Thanks, gals, for your insight. It's a good day in Mrs. Bolano's Heritage Spanish class at a North Carolina high school--thanks to DonorsChoose.org and several nationwide who believed in her need for Spanish-to-Spanish dictionaries, her classroom is now equipped with the tools she needs! I posted on this a while back; if any of my readers were among those to help out, ¡mil gracias! Did you know that Seattle is home to Spain Association of the Pacific Northwest? Check it out: http://www.spainassociation.org/. This is a group of Spaniards who have chosen the Seattle area as their new home + the people who love them + the people who just love all things Spanish. They periodically hold events that may be of interest to you. I personally cannot wait for the New Cinema from Spain Festival, right up the street at the Northwest Film Forum on Capitol Hill. It will be held November 14th through 20th. In fact, on Saturday, November 15th, they are sponsoring a Gala event at which they'll show the Spanish movie "7 Billiard Tables". The event will start at 1pm and will end at 4pm. If you think you want to attend, go to their site and click on the Evite link! ¡Fácil! I'm going to be teaching your Service Management & Marketing class this afternoon! 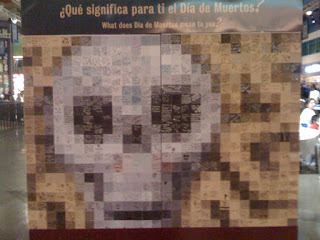 And yes, I will make sure you know all about Hispanic marketing and its necessity, even right here in lil' ol' Seattle. stories about some of the service-oriented brands we're working with and why they are successful with their strategies. 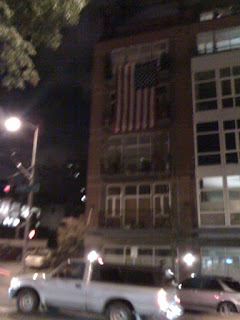 One of my neighbors is feeling like I am--proud to be an American! The University of Washington worked with State Farm Insurance and tú Decides Newspaper to conduct a Hispanic market study at a recent event. When local Latinos were asked about the most important issues when it comes to choosing a president, they listed economy and jobs at the top. As issues with greatest importance, the nation's economy, the state's economy and education led. When asked about whether the situation for Hispanics in Washington State was better, worse, or about the same, males and females responded significantly differently. The majority of women found it about the same (56.5%) or worse (30.4%), whereas men responded that it was about the same (38.3%) or better (30%). In general, we could say that Hispanics feel their situation here is about the same. Note that there was no significant difference in how U.S. born versus foreign-born Hispanics responded. Men were found to be generally much more confident about their financial situation than women, but in general Hispanics are only somewhat confident. TAKE A LOOK! ¡ECHE UN VISTAZO! 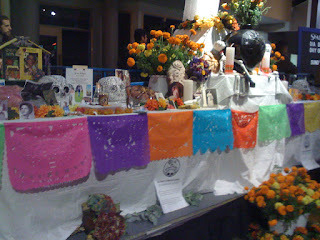 >>Sugar skulls on display, and a beautiful altar. 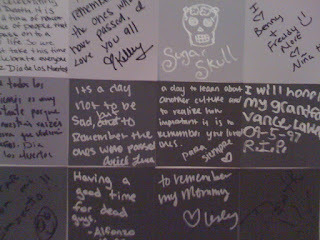 >>A wall of local messages created a skull design. 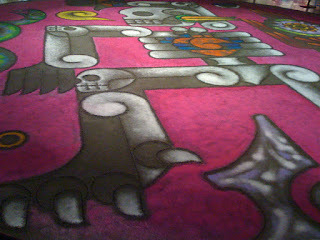 >>The tapete created out of sand was just gorgeous, as was this perfect Day of the Dead couple!